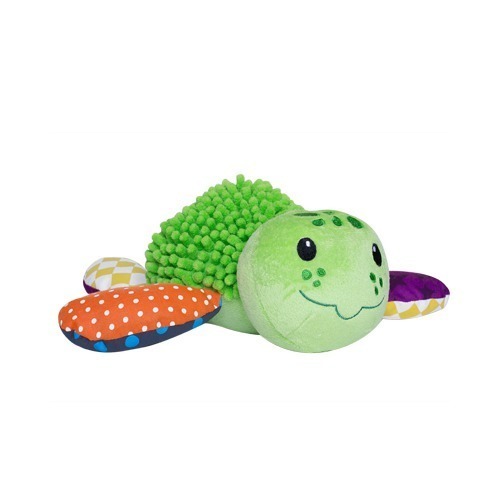 Lil' Prayer Buddy Sea Turtle is a plush, prayerful, and playful toy for children. With a press of the flipper, a child's voice recites 1 Corinthians 13:4-7. A second press turns it off for quiet time. An engaging toy for toddlers. Makes a wonderful baby gift. The Lil' Prayer Buddy Sea Turtle is an excellent toy for teaching little ones to pray from a very early age. 1 Corinthians 13:4-7: Love is patient and kind; love is not jealous or boastful; it is not arrogant or rude. Love does not insist on its own way; it is not irritable or resentful; it does not rejoice at wrong, but rejoices in the right. Love bears all things, believes all things, hopes all things, endures all things. WARNING: Batteries are enclosed with velcro on the belly of the sea turtle. Please be advised for children under the age of 3.